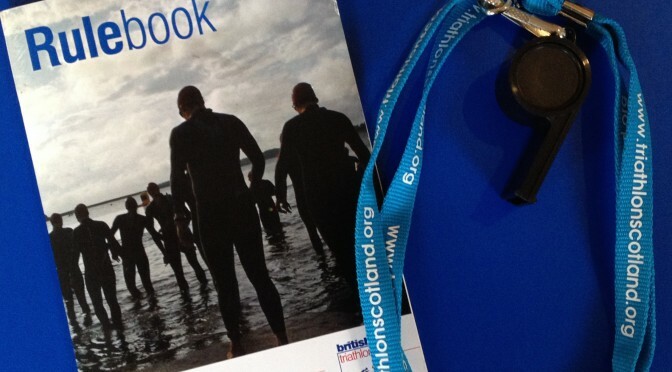 Yesterday saw the release of the new British Triathlon rulebook, to take effect immediately. Technical Officials had been told there would be a rules update in the New Year and that it would be small enough not to require the printing of a new rule book, but we hadn’t seen the rules before yesterday either. British Triathlon have also released a summary sheet, detailing the changes for those who don’t want/need to plough through the whole thing again. The changes are fairly minor and probably don’t pose any great challenges to most competitors. I am interested to see the clarifcations on being able to leave lights switched on and mounted to the bike in transition and on being able to hang bike clothing from the bike in transition. In line with other officials, I have previously asked for these to be removed and deemed them as “marking”. I still think they act as a marker in transition, but I’m pleased to have guidance in black and white, even if I disagree. Possibly the most significant change is over the duration of time penalties. These are now different for drafting and other penalties and dependent on the race distance. This is interesting as the penalty for undoing your helmet in transition is now only 10 seconds in sprint, down from 1 minute. That’s quite a big difference, especially when you consider how long it takes to respond to the verbal warning and refastening. Competitors would almost be better to not receive a verbal warning and just take the 10 second time penalty. The hard-to-implement rules on front zippers on trisuits being done up to the top have also been changed slightly, mostly for middle- and long-distance events. These are still quite hard to implement without a large officiating team, but definitely worth paying attention to at larger events such as qualifiers and National Championships. The updates also include changes to kids and (elite) Paratriathlon events, such as time penalties. In the case of paratriathlon, these are quite significant including changes to classification, so would be well worth a read if they apply to you. More information on the rule changes, together with the new rulebook and summary of changes can be found on the British Triathlon news article on the topic.